Do you have muddy waters? If you have a fish tank, add a catfish to the tank and see if your water gets cleaner. Do catfish help keep your fish tank clean? Whew! That aquarium looks dirty. If you’ve got a messy aquarium, will it help to add a bottom-feeding catfish? Create a hypothesis, your best guess about what is going to happen. Will the water look cleaner if there’s a catfish in the tank? Work with an existing fish tank or set up your own tank. If you’re setting up your own, it’s best to wait a month or so before you start the experiment. Clean out your fish tank. Get an adult to help you with this part. With your gravel vacuum, clean the gravel on the bottom of your tank. This removes some of the old fish food from the bottom of the aquarium. Make sure that the water you remove lands in the white bucket. Now, take a look in the bucket. Take a photo of the water. Place the plastic ruler into the bucket. How far down can you see? Note this in your notebook. Add a catfish to your tank. The catfish will swim around the bottom of the tank to eat. 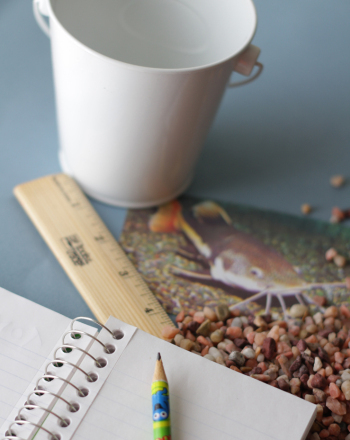 Feed your fish normally for two more weeks, adding a little extra food for the catfish. Clean your tank again. Take a photo of the water, and place the ruler into the bucket. Compare the two photos. Does one bucket of water look murkier than the other? How about the ruler measurements? Can you see deeper into the water in one bucket? An aquarium with a catfish will be cleaner than an aquarium without a catfish. Catfish are amazing animals. They can live in very dirty conditions, and they swim around the bottom of ponds, rivers, and even fish tanks, doing the business of cleaning up. Catfish are bottom-feeders, which means that instead of swimming to the top of the water to hunt and feed, they tend to eat food that falls to the bottom of a pond, river, or aquarium. If you feed your fish a bit too much, that extra food drifts down to the bottom of the aquarium, making your tank messy. After a while, this can change the water quality in your fish tank, making the water cloudy. This is especially obvious when it comes time to change the water in your fish tank. When you clean out the gravel, you’ll get a lot of muddy water. When you looked into each bucket and measured how far down you could see, you were taking a measurement of turbidity, or cloudiness in the water. The turbidity of the water tells you how much soil and sand is in the water. When you add bottom-feeding animals to a fish tank, this helps make the water clear. If your water is still cloudy and you have room for more fish, think about getting another catfish—they’re the vacuum cleaners of the water! What child isn't mesmerized by a fish tank full of colorful creatures? 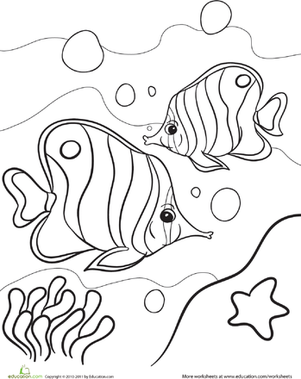 Give your child his very own mini-aquarium with this coloring page. Help Alex the Alligator count the number of fish in each tank. Use his mouth to help you distinguish whether the left or right tanks have more fish. These two fish are on their way to fish school! Encourage your little artist to make them as fancy as she wantsâshe can even make each scale a different colour. If your kid loves fish, have her do this fun worksheet with all kinds of pretty fish and she'll get some quick maths practise. 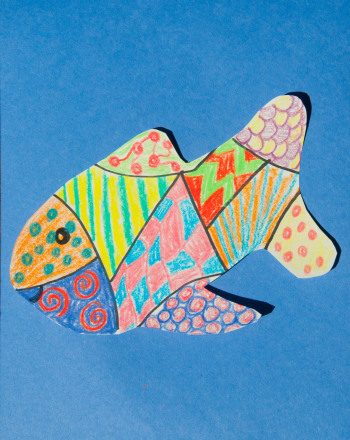 Using markers and construction paper, your child will design his own patterned fish. Help these lost fish get back in the pond! This cut and paste maths activity is a great way to introduce the concept of addition. Catch those fish before they get away! 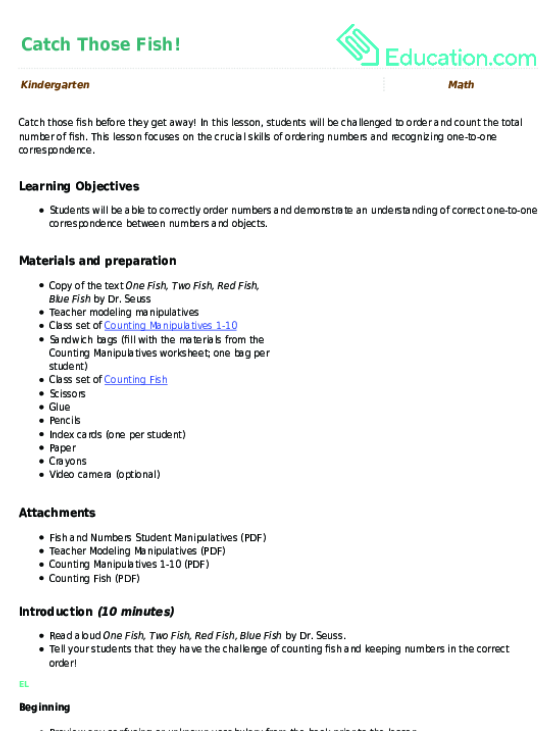 In this lesson, students will be challenged to order and count the total number of fish. 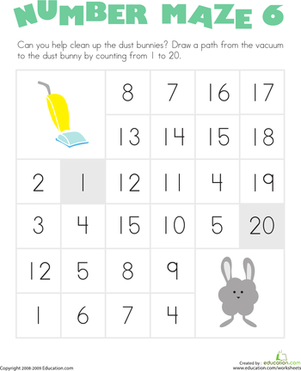 Kids help clean up the dust bunny, drawing a path from the vacuum to the dust bunny by counting from 1 to 20. Use this glossary with the EL Support Lesson: Ordering Fish.